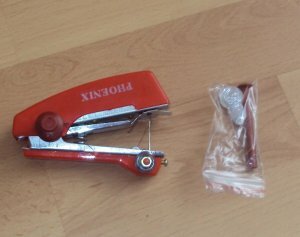 Mini sewing machine, worth a purchase? Discussion in Fashion & Apparel started by prettycolors • May 8, 2014. I was browsing a Chinese website and found some sewing machines, the small kind, operated by hand. They're dirt cheap, 2.35$ a piece and the shipping is free. I'm in the habit of repairing my clothes so naturally I'm wondering how these sewing machines work. Are they worth a purchase? I never used one before, only sewing needles. This is really interesting, I'm into arts and crafts and I think this item is something I would love to have..if it works. It would be a breeze repairing and jazzing up old clothes. If you ever purchase it please let me know if it works. Thanks. I think that instead of carrying that around I'd prefer the small box with the needle and thread, I'm not sure how easy the machine is to use in a tight spot. A thousand times yes, they are a godsend, my sister bought me my first one of these and I loved it then and I love it now. They are so handy if you need to do a little thing quickly without having to drag the machine out, thread it up and disturb the neighbours with the noise. I fixed my fiancées trousers just this Saturday with mine so I would always recommend them! If you're going to use that mini sewing machine to repair your clothes, then it's definitely worth purchasing. I have a mini sewing machine myself and it's helped me with my quilt project way back in high school. It's easy to operate and you can even take it with you anywhere. Just bring extra batteries and it'll function like usual. Reading the positive things people are saying here has made me think I might want to try one of these again. I bought one about twenty-five years ago and loved it for about a week before it broke. I sent it back and was given another one and it didn't last any longer than the first. I gave up thinking it was a good idea but that the product was crummy. Obviously they have improved on them since then.